Jekel Loves Hyde by Beth Fantaskey. Jill Jekel has always obeyed her parents rules;especially the one about never opening the mysterious, old box in her father's office. But when her dad is murdered, and her college savings disappear, she's tempted to peek inside, as the contents might be the key to a lucrative chemistry scholarship. To improve her odds, Jill enlists the help of gorgeous, brooding Tristen Hyde, who has his own dark secrets locked away. As the team of Jekel and Hyde, they recreate experiments based on the classic novel, hoping not only to win a prize, but to save Tristen's sanity. Maybe his life. But Jill's accidental taste of a formula unleashes her darkest nature and compels her to risk everything, even Tristen's love just for the thrill of being . . . bad. It's all just a little bit of history repeating... What if the story of The Strange Case of Dr Jekyll and Mr Hyde by Robert Louis Stevenson were true? What if the formula that Doctor Jekel created really worked and altered the course of the Jekel and Hyde families forever? This is the basis for Jekel Loves Hyde and Fantaskey, author of Jessica's Guide to Dating on the Dark Side , does a fabulous job of reeling the reader in from the very first page. Jill Jekel and Tristen Hyde's lives are about to take a bizarre turn, but they are both so filled with realistic flaws and feelings that the entire scenario feels utterly believable. Jekel Love Hyde will take you on a thrilling ride of danger and young romance. A suspenseful paranormal read that young adult paranormal romance fans will drink up like the elixir within its pages. A heady draught both bitter and sweet. 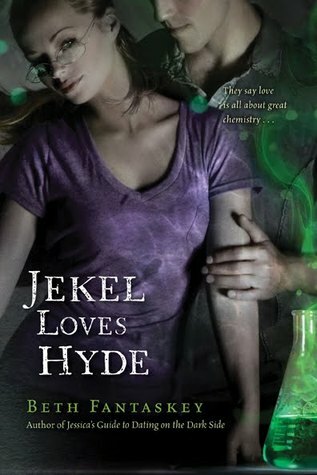 I recommend Jekel Loves Hyde to readers of young adult, paranormal romance, urban fantasy, paranormal mysteries, and especially to fans of paranormal suspense. Jekel Loves Hyde may appeal to fans of The Hollow by Jessica Verday and Nevermore by Kelly Creagh. Jekel Loves Hyde on Amazon . Jekel Loves Hyde on Goodreads. Great review! I've had my eye on this one for a year! Haven't seen a copy of it anywhere though! I had read some very mixed reviews about this one, but was glad I took a chance. Once I started reading this, I couldn't put it down. I just love the cover for this - the green purple and grey... so pretty! I just think it's great to see more and more novels of this sort that don't revolve around vampires, or werewolves, or elves. Progress good.